Dear Daddy – Haven’t rec’d letters from you since Mon. and this is Fri. Your last was Jan. 29. We have had the prize snow of the season. Quite a lot of snow and wind which drifted the snow in some places until it is waist high. In the west side yard Mark walked out into a drift that was knee deep. I took some pictures of our home, Statons & Foulkes. John and Mark got into the pictures here. David was asleep so he missed, but it’s too much to try to get his picture in a snow drift. John and I shoveled the snow off the driveway and front walk yesterday and this a.m., it was drifted over again. John is out now working on it again. Mark has gone to the dentist – says he has a toothache. There isn’t any school today because the busses can’t get through. I don’t know how the town streets are but I suppose the Street Dept. is trying to keep the drifts cleaned off. Bart has been running pictures of service men in his paper – you guessed it – yours was in this week. But I don’t believe you will object – he didn’t say anything but how long you had been in service, etc. I see Jimmie Staton out playing in the snow. It is very invigorating out now, not too cold, but colder predicted for tonight. Just hope the cold wave doesn’t last too long – or that we can get more good coal. The way the wind blew when it was snowing, we had snow on the windows – the effect Arlene had with cotton at Christmas – you remember I helped her decorate one year. David is awake and ready for action. 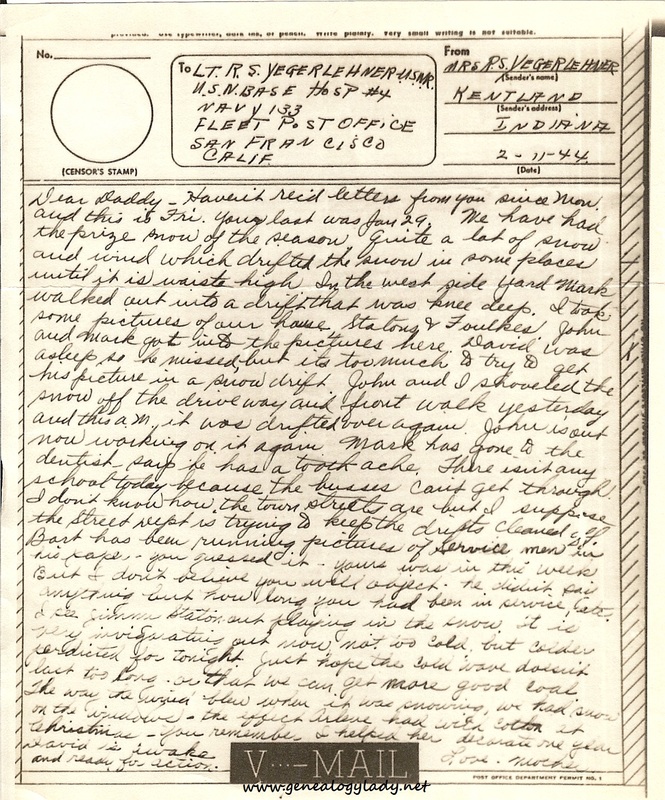 This entry was posted in Foster, Genealogy, World War II, World War II Letters, Yegerlehner and tagged Arlene Funk, David A. Yegerlehner, Foulkes, genealogy, Gladys R. (Foster) Yegerlehner, Indiana, James Staton, John F. Yegerlehner, Kentland, Mark A. Yegerlehner, Newton County Enterprise, Roscoe S. Yegerlehner, Staton, Ward K. Bartlett, World War II, World War II letters on December 1, 2015 by Deborah Sweeney. “Bart has been running pictures of service men in his paper – you guessed it – yours was in this week.” Somewhere in the archives…..